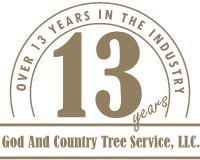 God And Country Tree Service, LLC. Is the landscape on your property protected when a storm hits? Don’t get stuck with the expenses of property damage caused by lightning. Lightning can cause significant damage to trees, and fallen branches from a lightning strike can cause significant damage to your home or vehicle. God And Country Tree Service, LLC. protects your family and property from injury and damage that can easily be prevented. Trees in close proximity to your home or business should be assessed for their susceptibility to lightning strikes. Several important factors are considered in order to safely protect a tree from storm damage, including the species of the tree, its height and how close it is to any building or structure. The arborist at God And Country Tree Service, LLC. are available to determine the best protection for your property in the Roseburg area. Call (541) 761-5141 for more information. All information provided is provided for information purposes only and does not constitute a legal contract between God And Country Tree Service, LLC. and any person or entity unless otherwise specified. Information is subject to change without prior notice. Although every reasonable effort is made to present current and accurate information, LinkNow™ Media makes no guarantees of any kind.